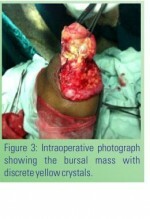 Rare presentation of CPPD in form of isolated bilateral olecrenon bursitis. Dept of Orthopaedics, J.S.S. Hospital, Ramanuja Road, Mysore – 570004, Karnataka, India. Introduction: Calcium pyrophosphate crystal deposition disease (CPPD) is the most common form of crystal arthropathy second only to gout. Common clinical presentation is an acute monoarticular arthritis commonly occurring in knee joints. We presented a case of bilateral olecranon bursitis in a calcium pyrophosphate crystal deposition disease. Case Report: A 42-year-old female patient is presented with golf ball sized painless swellings in the posterior aspect of her elbows. Elbow joints were clinically normal except for restriction of terminal flexion. X-ray showed mild erosion at the tip of olecranon. Excision biopsy of the swelling showed positive birefringent calcium pyrophosphate dehydrate crystals on the inner wall of the specimen on polarized light microscopy. Conclusion: Bilateral olecranon bursitis may be part of the extraarticular manifestations of calcium pyrophosphate dihydrate crystal deposition disease with good prognosis following in toto bursa excision. Keywords: Olecranon Bursitis, Crystal deposition disease, Calcium pyrophosphate, Elbow. Calcium pyrophosphate crystal deposition disease (CPPD) is the most common form of crystal arthropathy second only to gout. Common clinical presentation is an acute monoarticular arthritis commonly occurring in knee joints . Uncommonly presentation could be similar to rheumatoid arthritis or spondyloarthropathy . Olecranon bursitis is a condition in which there is inflammation of the bursa that overlies the olecranon process at the proximal aspect of the ulna. Olecranon bursitis is a relatively common condition . Patients with olecranon bursitis usually notice focal swelling at the posterior elbow. Pain at the affected site is usually reported; however, the swelling is sometimes painless . Bursal inflammation may be caused by a variety of mechanisms. Due to the superficial location of the olecranon bursa, it is susceptible to inflammation caused by acute or repetitive trauma, and less commonly, infection1. Inflammation as part of systemic inflammatory process (e.g., rheumatoid arthritis) or crystal-deposition disease (e.g., gout, pseudogout), Side effect of sunitinib used to treat patients with renal cell carcinoma [1,2]. Although calcium pyrophosphate dehydrate (CPPD) crystal deposition disease, also referred to as articular chondrocalcinosis, most often involves articular cartilage, extraarticular deposits have occasionally been found. They have been described in the ligamentum flavum, in the dura mater, in the Achilles tendon, and in the tissues between lumbar spinous processes [3,4]. Other similar deposits have been reported in the quadriceps and triceps tendons in patients with articular chondrocalcinosis [4,5]. We are presenting a case of CPPD presenting only as chronic bilateral olecranon bursitis without any other manifestation. The case reported here points out that olecranon bursitis may also be one of the extraarticular manifestations of CPPD crystal deposition disease. A 42 years old female presented with bilateral elbow swelling since 3 yrs. She suddenly noticed small pea sized swelling with pain on right elbow 3yrs back and after 2 months started on left side. Both swellings gradually increased to present size of a golf ball (Fig 1a & b). Swellings were painless but associated with minimal restriction of elbow flexion movement. She had no history of trauma, micro trauma, fever, discharging sinus, other joints involvement and renal stone. On clinical examination a solitary mobile globular 5cm x 5cm in size non tender soft to firm in consistency without any signs of inflammation present over the posterior aspect of both elbows. Elbow joints showed no evidence of effusion or instability. Elbow movements were painless with terminal 15* restriction of flexion. All other joints were clinically normal. Details of investigations as per following table 1: She underwent open bursectomy. 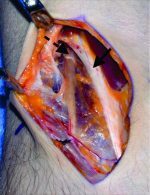 The bursa was excised in toto;(Fig 3) a careful examination during surgery did not show any pedicle or communication with the elbow joint and specimen sent for histopathological examination (Fig 4a & b). On histological examination, showed fibrocollagenous tissue with focal collections of chronic foam cells, congested vessels and haemorrhage, multiple irregular deposits of positive birefringent calcium pyrophosphate crystals with surrounding granulomatous lesion (Fig 5, 6). On post operative follow up patient has painless full range of movements and wound healed without complications and patient satisfied (Fig 7a & b). She was started on cholchicine to prevent another attacks or recurrence. Follow-up after 1 year shows full range of movements and x-rays were done shows no calcification. Extraarticular deposits of CPPD crystals can be found in tendons but, to our knowledge, no case of isolated bursitis has ever been reported associated with CPPD. CPPD crystalline deposits occur almost in and around the joints and are characterized by the presence of calcification of the articular cartilage, menisci, synovium, and periarticular tissues . These deposits may be asymptomatic or associated with chronic articular manifestations or acute episodic arthritis, as well as a wide variety of other musculoskeletal manifestations . The various clinical patterns of CPDD include pseudogout (acute synovitis), pseudorheumatoid arthritis, chronic pyrophosphate arthropathy (pseudo-osteoarthritis), asymptomatic CPPD deposition, pseudoneuropathic joints, hemarthrosis, monoarthropathy, solitary tophaceous deposit, traumatic arthritis, and pseudo-ankylosing spondylitis have been reported in the literature . The pseudogout presentation is a frequent cause of acute monoarthritis in the elderly . This attack may be precipitated by trauma, surgery, serious medical illness, such as myocardial infarction, stroke, and pneumonia, and arthroscopy . The knee is the most commonly involved joint, followed by the wrist, shoulder, ankle, and elbow. The pseudogout should be differentiated from gout and septic arthritis . Approximately 5% of the CPDD patients present as pseudorheumatoid arthritis with multiple joint involvements with subacute or chronic attacks lasting 4 weeks to several months . In these cases, the differential diagnosis between CPDD and rheumatoid arthritis is difficult . Such a diagnostic problem can be solved by radiologic evaluations. The patients with CPPD usually show chondrocalcinosis and bony erosions are not apparent in uncomplicated CPDD, while the patients with rheumatoid arthritis show bony erosions and destructive joint changes . CPDD is associated with age, trauma, osteoarthritis, and some metabolic diseases, such as hyperparathyroidism, hypomagnesemia, gout, hemochromatosis, hypothyroidism, and hypophosphatasia . Our patient had no evidence of metabolic disorders. In addition, there was no evidence of precipitating factors. 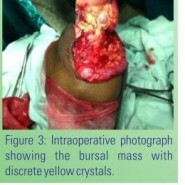 Our observation emphasizes the fact that CPPD crystal deposition disease must be considered one of the possible causes of nonseptic olecranon bursitis, in addition to local repeated mechanical friction or gout, which are much more commonly encountered. The diagnosis of CPPD can be confirmed by demonstration of the weakly positive, birefringent, rhomboid-shaped calcium pyrophosphate crystals associated with typical symptoms. CPPD crystals may coexist with urate or basic calcium phosphate in inflammatory rheumatoid arthritis, degenerative osteoarthritis as well as in charcot joint . The synovial fluid white count is usually around 20,000/mm3. Acute episodes of pseudogout may be relieved by joint aspiration alone . Treatment is primarily symptomatic, since there is no known drug that can prevent progression of the joint destruction. Nonsteroid anti-inflammatory drugs (NSAIDs) and intra-articular or systemic glucocorticoids are the most useful treatments . Colchicine can be effective in recurring pseudogout, and magnesium can be used prophylactically . In a small uncontrolled series methotrexate was effective and aroused interest; it can be used when other treatments fail10. Some patients require joint debridement and surgical reconstructive procedures. CPPD is not a very uncommon condition. But there may be unusual presentations. Bilateral olecranon bursitis may be part of the extraarticular manifestations of calcium pyrophosphate dihydrate crystal deposition disease with good prognosis following in toto bursa excision. 1. Reginato AJ, Reginato AM. Diseases associated with deposition of calcium pyrophosphate or hydroxyapatite. In: Ruddy S, Harris ED, Sledge CB, editors, Kelley’s textbook of rheumatology, 6th ed. Philadelphia. Saunders, 2001; 1377-90. 2. Gregory T, Mir O, Medioni J, Augereau B, Oudard S. Olecranon bursitis in patients treated with sunitinib for renal cell carcinoma. Med Oncol. Jun 2010;27(2):446-8. 3. Kawano N, Yoshida S, Ohwada T, Yada K, Sasaki K, Matsuno T: Cervical radiculomyelopathy caused by deposition of calcium pyrophosphate dihydrate crystals in the ligamenta flava. Case report. J Neurosurg.1980 Feb;52(2):279-83. 4. Gerster JC, Baud CA, Lagier R, Boussina I, Fallet GH: Tendon calcifications in chondrocalcinosis: a clinical radiologic, histologic and crystallographic study. Arthritis Rheum 20:717-722, 1977. 5. Genant HK: Roentgenographic aspects of calcium pyrophosphate dihydrate crystal deposition disease (pseudogout). Arthritis Rheum 19:307-328, 1976. 6 Announ N, Guerne PA. Diagnosis and treatment of calcium pyrophosphate crystal-induced arthropathy. Z Rheumatol. 2007 Nov; 66(7):573-4, 576-8. 7. Abhisek A, Doherty M. Pathophysiology of articular chondrocalcinosis–role of ANKH. Nat Rev Rheumatol. 2011 Feb; 7(2):96-104. Epub 2010 Nov 23. 8. Doherty M. Crystal-related arthropathies: calcium pyrophosphate dihydrate. In: Klippel JH, Dieppe PA, editors, Rheumatology, 2nd ed. London, Mosby, 1998; 8.16.1-12. 9. Doherty M, Dieppe P, Watt I. Low incidence of calcium pyrophosphate dihydrate crystal deposition in rheumatoid arthritis, with modification of radiographic features in coexistent disease. Arthritis Rheum 1984; 27: 1002-9. 10. Announ N, Guerne PA. Calcium pyrophosphate dihydrate crystal induced arthropathy. Rev Med Suisse. 2007 Mar 21;3(103):740-2, 744, 746.